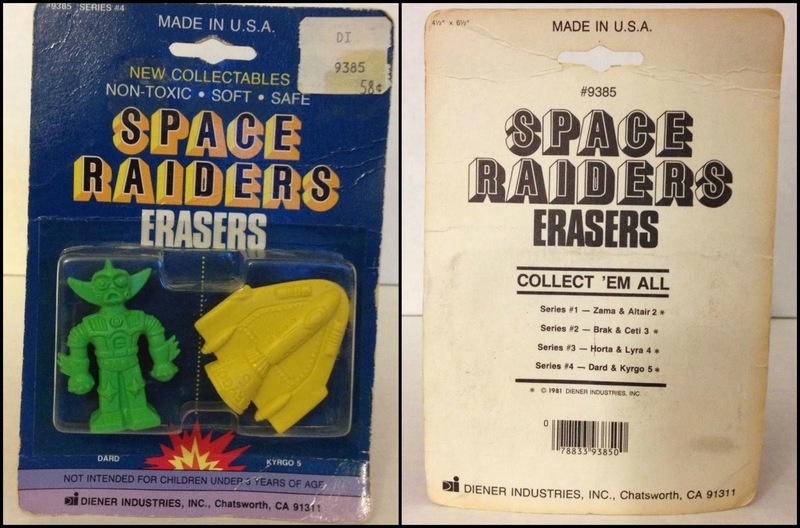 Diener Space Raiders erasers are responsible for some of my earliest toy memories. 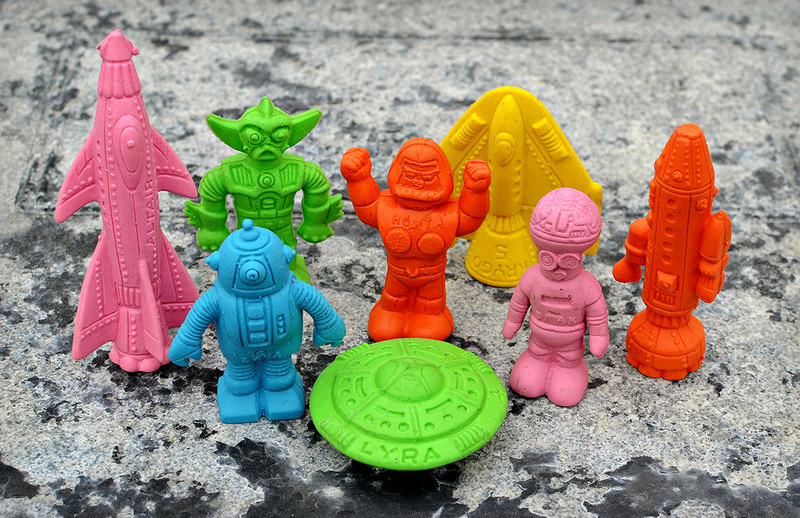 I'm too young to have experienced getting them in McDonald's Happy Meals around 1979-1980, but I vividly remember getting my first one--a green BRAK alien--in one of the kids meals they used to sell at the cafes in K-Mart stores in the late '80s. I can still recall the bags/boxes the kids meals came in having some fun space artwork on them, too (wish I would have saved one). Am I the only one who remembers getting kids meals at K-Mart? I know for a while they were giving away dinosaur figures in them, too. Anyway, even though my history with these rubbery weirdos goes way back, it wasn't until very recently that I finally completed a set. They aren't particularly hard to find, but I was just piecing together the last ones I needed whenever I noticed a good deal pop up. I'm happy to finally have the whole team assembled. Okay, now let's take a closer look at each of the Raiders. I've separated them based on how they were paired up in the carded 2-packs. CETI 3 and BRAK: While I've always found the space ships less interesting than the aliens/robots, CETI 3 is undoubtedly a very nice, detailed sculpt. Of course, BRAK, who I called "cranium creature" as a kid, has sentimental value to me because of the reason I described at the beginning of this post. But he'd probably be my favorite regardless. I find anything that looks even vaguely like the Metaluna Mutant to be awesome. Plus, I just love his head/face design, with that cranium circuitry and those zoned out eyes. BRAK's design was clearly "borrowed" from that of the Robocon character Robo Gari. KRYGO 5 and DARD: The KRYGO 5 spacecraft doesn't look too exciting on its own, but it's a nice addition to the full set when viewed together. DARD has always looked like a villain to me. Maybe it's because he has a slight resemblance to Darth Vader. Actually, the character seems to be a cross between Vader and Getter 1 from the Getter Robo anime series (thanks to universalmonsterarmy.com forum member NekroDave for making me aware of the Getter Robo connection). 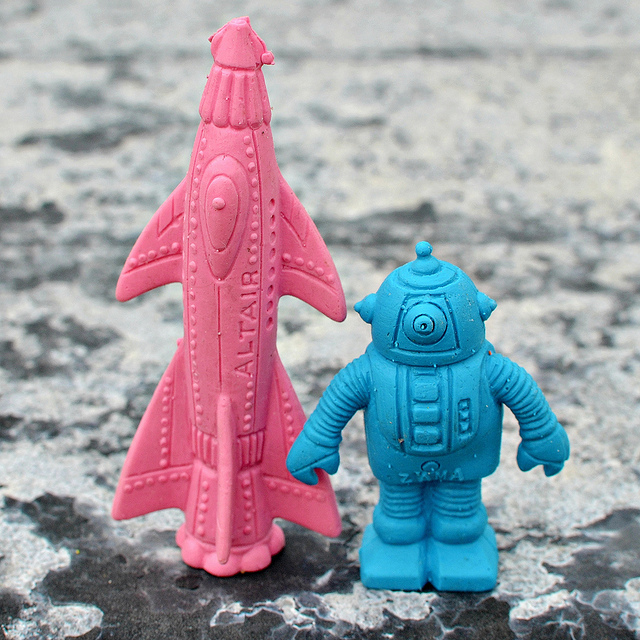 ALTAIR 2 and ZAMA: ALTAIR 2 is sort of like the mother of all space ship erasers. It's definitely the tallest. The one-eyed ZAMA seems to be based on the Robocon title character, but with a different head. He looks like he'd probably be the lovable bumbling idiot of the group. 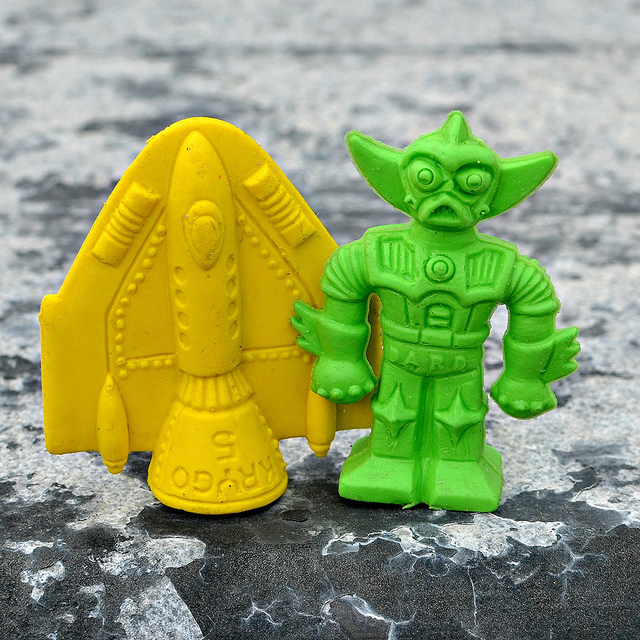 LYRA 4 and HORTA: I remember having a knockoff of this flat spaceship as a kid in a firmer rubber, but it was the last one I got to complete my genuine Space Raiders set. Of all the ships, it's the one that most makes me think of how incredibly out of scale they are with the robots, but I guess you're not supposed to think about that. HORTA would have to be the old curmudgeon of the bunch, as indicated by his fist-shaking and unkempt robo-stache. He was based on Robocon's Robo Gaki. Wait, what do we have here? Two additional Space Raiders? 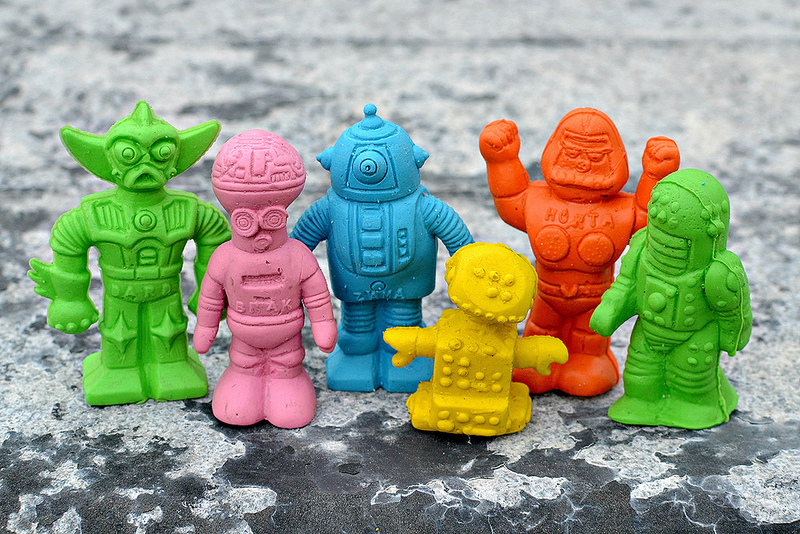 Honestly, I don't know what they are, but they sure go nicely with the Space Raiders. I'm pretty sure I got these guys sometime in the '90s and I'm pretty sure they were sold individually in a big tub of Dieners. Comments on the aforementioned 2 Warps to Neptune post about Space Raiders notebooks mention two additional characters (Draco and Alcor) being included as part of the notebook artwork, which makes me wonder if these figures might be Space Raiders after all. Unfortunately, I can't find images that show the art for Draco and Alcor, so I can't say for sure either way. Who can help shed light on their true identities and origin? Anyone? And there you have it! 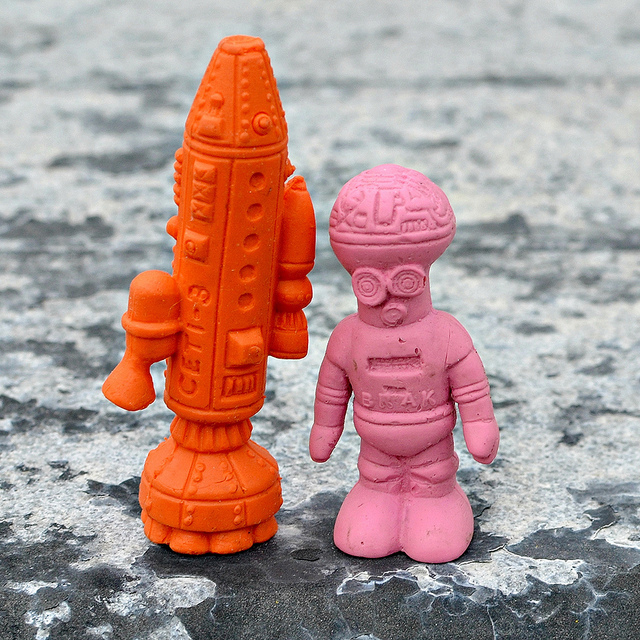 One of the classic eraser sets from the much-missed Diener Industries. What do you think of them? 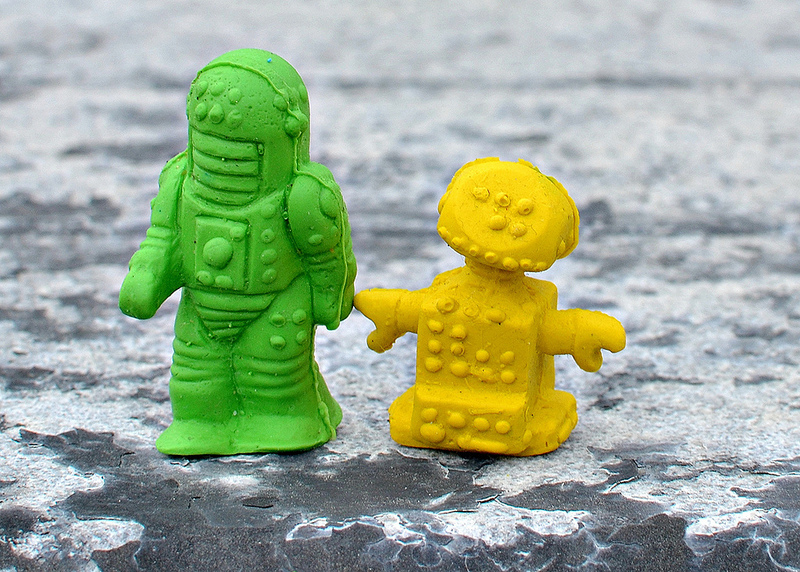 Any Space Raiders memories you'd like to share? I love these sets. I had them all too. I could even get away with having them in class because hey, they're not toys! They're erasers! Yeah, that didn't always work. Makes me wonder how many Diener erasers were confiscated by teachers over the years! I had most of these as a kid and they still look just as awesome today as they did back then...use to buy these for .25 cents at the school book store i think too. I loved having these in school. Of course they were never ever used as erasers! Sitting on a few in the grey and brown color ways. Great stuff. I'm looking for a BRAK in brown if you happen to have one of those. I recently found a gray one so I'm trying to get him in all colors now. I bought a few of these little guys in the office of my grammar school around '79 or so. I still have them (blue Brak, pink Horta & blue Zama). I remember the spaceships being sold out of a display box, but it was a long time ago and I could be mistaken. Thanks for reading. So many people have memories of these Diener figures! He does sort of look like that! Awesome page, thanks for the plethora of info and research! I always wondered what each character was based on. Very nice work! 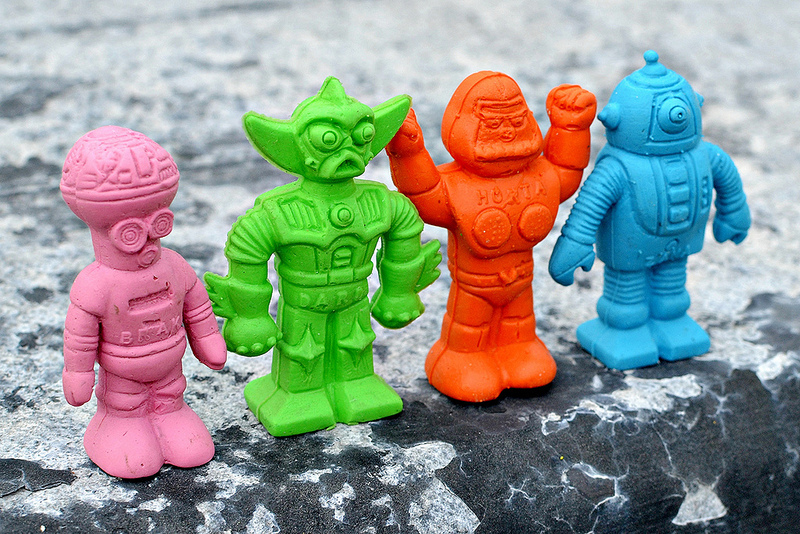 This was fascinating to read because I grew up w/ space raiders and was obsessed with them (born in 1970). I had them all, and do remember the brown and grey ones were rare. We traded them at school, wrote stories about them, drew them, etc. My mom threw them away when she moved houses but I found a bunch on ebay and have most again. Had no idea there was a notebook with a back story. nice job! Glad you enjoyed the post! Thanks for commenting. Always fun to read memories from other collectors.